A fatal bus accident claimed the lives of two Phoenix residents early Sunday morning. According to the Phoenix Police Department, the crash occurred near the intersection of Thomas Road and North 79th Avenue. Just before 7 a.m., a local transit bus came to a stop on Thomas Road as it waited for oncoming traffic to pass before making a left-hand turn into the Desert Sky Mall parking lot. As the bus attempted to turn, a vehicle driven by one of the two victims slammed into the back of the bus. Upon impact, the victim’s vehicle burst into flames. 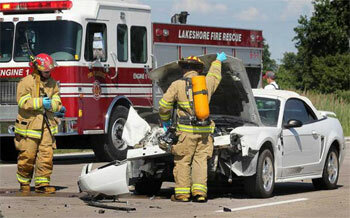 The driver of the vehicle, as well as the vehicle’s passenger, were unable to free themselves from the wreckage. When emergency responders arrived at the scene, they were able to extract the victims from the vehicle and transport them to a local hospital. However, upon arrival, the first victim was pronounced dead. The second victim died several hours later. As a precaution, two people riding the bus at the time of the accident were also taken to an area hospital and treated for minor injuries. Currently, police are investigating several possible causes of the bus accident. In a similar incident earlier this year, a motorcycle collided with a transit bus near the intersection of Third Street and Fillmore Street. As the bus attempted to make a left-hand turn, a motorcyclist crashed his bike into the back of the bus. There were no passengers on the bus during the accident, and the motorcyclist was transported to the hospital in critical condition. Every day, Phoenix residents rely on buses to safely transport them around the city. But unfortunately, bus accidents happen on our roadways; and when they do, the results can be disastrous. If you or someone you love has been the victim of a bus accident, contact the skilled bus accident lawyers at Phillips Law Group today. Our personal injury lawyers have the knowledge and experience to get you the justice and compensation you deserve. Call (602) 258-8888 or fill out our FREE Case Review Form.